New development studio Lucid Games are behind the resurrection of Geometry Wars and with the studio consisting of many ex-Bizarre Creations staff, the signs are promising for the revival of this gaming classic. I first met Geometry Wars in the Project Gotham Racing series on the Xbox 360 and this little addition proved to be quite a distraction from the racing track. Geometry Wars 2 remains one of my favourite Xbox Live Arcade games on the 360 but the series sadly died along with Bizarre Creations. Fear not Geometry Wars fans, it is back. The basic formula remains unchanged; this is a twin stick shooter which can be blisteringly fast, frantic, spectacular and frustrating. The most obvious change from previous iterations is that Geometry Wars has now landed on Playstation. The Playstation platform had its own twin stick shooter game in the form of Super Stardust. 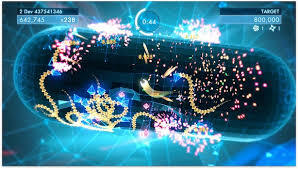 Whilst Geometry Wars was all about the high score and beating friends, Super Stardust added levels and an end point which became the priority over the high scores. As great as Super Stardust is, I always felt Geometry Wars was the better game. The level structure of Super Stardust made for a lengthier game meaning Geometry Wars was more suited for a quick blast and as a result, had a strong ‘one more go’ appeal. A new Super Stardust game is heading to PS4 but Geometry Wars has fired the first shot. 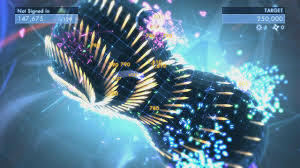 For a ‘next gen’ game, Geometry Wars has retained its minimalist looks but somehow it manages to impress. The game really just consists of wire frame graphics but the bright colours, fast pace, busy screen and numerous explosion effects all make for quite a spectacle. The catchy dance track sound track is also rather fitting with the action. The enemies (i.e. shapes with a dislike of your shape) are varied in style and their movement patterns. They all have a common goal and that is to end your game and they are rather effective at their job. They screen can be fill up very quick and the varied patterns of movement greatly increase the challenge when you need to get yourself out of a tight spot. Destroyed enemies will drop tokens called geoms which add to your multiplier. This is the key to high scores but the tokens don’t hang around for long. This means you need to head towards the enemies as they are destroyed to maximise the multiplier, an action that goes against my shoot and retreat instinct. The rush to pick up as much multiplies as possible does add to the risk and it is easy to miss an enemy as you rush in blind before the explosion from the destroyed enemies has subsided. The action used to take place on a flat surface but there is now a lot of variety. The traditional surface is still there, at times it is morphed and rippled but veterans of the series will soon find themselves on unfamiliar ground. There is the globe shape which will make Super Stardust players feel instantly at home and the surface shaped like a pharmaceutical capsule is an interesting experience. Some surfaces have barriers and in some stages the barriers rotate adding an extra distraction. It all moves very smoothly and quickly and all new surfaces work very well in their own unique ways. Perhaps taking some inspiration from Super Stardust, Geometry Wars 3 now comes with different levels to complete. Adventure Mode is the main course and this consists of individual stages with 3 score targets to aim for. Each target obtained rewards you with a star and you will need stars to unlock further stages. Each stage has its own setup to avoid simply repeating score challenge after score challenge. Some stages see you dive in with one life, others have a time restriction and so forth. Boss battles also make an appearance after a set number of stages. In each stage you can also see the score obtained by your friends to add that element of competition. You have an AI controlled companion in the shape of a drone which follows you about and helps in the battle. Or it should help but I will admit to sometimes mistaking it for an enemy and trying to get away from its close proximity. The drone can be upgraded (geoms currency) by boosting its attack or defensive qualities and there are also different varieties of drones to be unlocked. The drones add a strange twist to the competitive element. You see a friend’s score but you have no idea what ‘setup’ they used at the time. I can’t help but feel a like for like element is crucial in a leaderboard comparison. But still, you can put that to the back of your mind easily and still enjoy beating a friend’s score. My other gripe is that whilst Adventure Mode initially seems like a good idea, it isn’t long before you cannot progress. Geometry Wars is a challenging game, very challenging at times. I am yet to even obtain 3 stars on the very first level and I am top of the leaderboard among my friends. This means repeatedly trying levels to achieve scores which border on seeming impossible to reach. Upgrading the drone plays a part but that involves a lot of replaying of the same levels in order to gather enough ‘currency’. There are 50 levels in Adventure Mode and a lot are going to feel out of reach for a while and some people, may not see very many of them at all. The Classic mode offers some of the game modes found in Geometry Wars 2 which is a handy way to forget you are stuck in Adventure Mode. These play out exactly as before and are every bit as addictive. Geometry Wars is still the best twin stick shooter around and this new iterations is just as addictive. The challenge in Adventure Mode and the drone muddying the leaderboards a bit do ever so slightly lessen the experience but the Classic games are satisfactory compensation.